The hybrid tea rose Joanna Hill was first bred in 1928 in the United States by Joseph Hill. 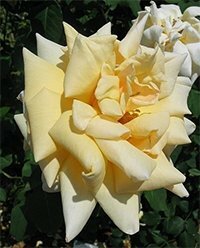 This variety was created by crossing the rose Madame Butterfly with a Miss Amelia Gude rose. 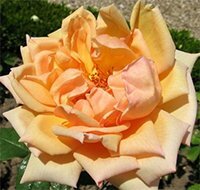 The result is a pale yellow hybrid tea rose with darker centers that slowly fade to a light cream color as the blooms age. The blooms will have a somewhat strong fragrance which makes them a great choice for cut flower arrangements. These roses will be somewhat compact for a hybrid tea rose, only growing to around 4 feet tall at full maturity with a width of around half its height. The blooms on Joanna Hill roses will mostly form on solitary stems and the zone requirements are fairly typical with this rose doing well in zones 6 and warmer. One of the nice features about hybrid tea roses such as this one that stay compact in size is they make for excellent container roses. The strong fragrance also means that you can bring your roses onto your porch or patio where you can better smell them and brighten up the area. Growing the rose Joanna Hill is not a difficult task and if you have any prior experience growing roses, then you will not find this one at all challenging. The biggest choice that you will have to make is where in the garden you grow your roses. Roses require quite a bit of sun light if you want them to give you their best performance. For this reason among others, you should try to select a location that provides no less than 6 to 8 hours each day of direct sun light. You also will want to make sure that you are growing your Joanna Hill roses in soil that drains well. This is rather easy nowadays as you can find a wide range of different soil mixes at your local garden center. Simply select the one that works best for you. Many of which will be mixed specifically for roses. 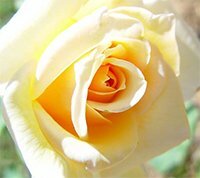 Another factor that many growers overlook is you should subject your roses to the natural air currents flowing through your garden. 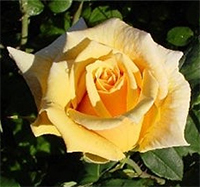 This will go a long way towards keeping the leaves of your rose Joanna Hill dry, especially after the morning dew, which in turn keeps the overall plant much healthier. Getting your rose Joanna Hill into the ground is pretty straight forward and most folks can get the job done with a few basic hand tools. If you bought your rose from a local nursery, then chances are they already had it planted in a container and ready to bloom. These are by far the easiest roses to plant. Dig your hole at least twice the diameter of the container, and equally as deep. This will keep the bud union at its current depth while still giving you plenty of room around the roots for your soil mix. If you bought your Joanna Hill roses online, then chances are they were shipped to you as bareroot plants. These might look intimidating but they are easy to plant also. You should first soak the roots overnight in a bucket of room temperature water prior to planting day. Then dig your hole as wide as the longest roots on the plant and deep enough to allow you to set the plant on top of a mound of soil, while keeping the bud union about an inch or so below the surface. Once you have your rose Joanna Hill set in place, spread the roots out in all directions around the mound and then back fill the hole halfway to start, using your soil mix. Take the garden hose and water the loose soil heavily until it flows around the roots like mud, then go ahead and continue filling the hole the rest of the way. Give it one more deep watering and then top off any final settling that may occur. This method should ensure that no air pockets have formed around the roots during planting. 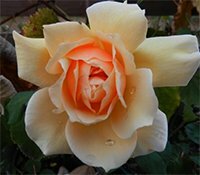 Taking care of the rose Joanna Hill is a pretty simple matter and again, if you have any prior experience growing hybrid tea roses, this will be a piece of cake for you. You will need to make sure that you are providing ample water to your roses, while taking care not to overdo it. For most climates, this will usually amount to one deep watering per week. If your weather is hot or dry, you may want to check on your roses every couple of days. You also should consider giving your Joanna Hill roses a dose of a granular all-purpose fertilizer in the early spring when you see the leaves start to form on the plant. This will give the plant a big jump on the season. Like most hybrid tea roses, this one is also a repeat bloomer so you might want to give it a couple more feedings over the season. I will typically give my roses their second feeding immediately following the first big bloom, and then a third feeding sometime around the middle of the summer to encourage some late season blooms. Your rose Joanna Hill will do well on this schedule also. You should always prune your rose Joanna Hill in the very early spring after the weather breaks but before the leaves start to bud. This just makes the process so much easier. Start by removing all the dead and discolored wood from the plant and set your cuttings aside. Next, prune back any overlapping canes so the leaves on these will not compete for sun light later on. Lastly, give the remaining canes a cut back by about one third of their current height to promote new growth. This is also the time to rake up around the base of your Joanna Hill roses to get rid of all the dead leaves and debris that might have collected there over the winter. Throw all of this material away in the trash along with your cuttings. Never let decaying matter lay around your roses as it can quickly turn into a breeding ground for various pests and diseases. Finish up your pruning by giving your rose Joanna Hill a fresh new layer of mulch to start off the growing season.